I decided what I had been stuck on was having Very Vanilla as one of my colors. 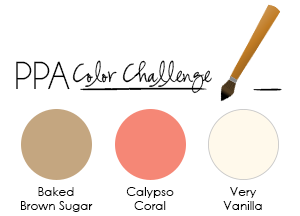 I kept wanting to add another color to the Baked Brown Sugar and Calypso Coral. Once I got past that block, the card came together very quickly. I used my Stamp-A-Ma-Jig to place the flowers exactly where I wanted them and stamped once with full ink and then stamped a second time without re-inking (just huffing on my stamp to remoisten the ink) to acheive a variation in color. The sentiment comes from "Another Thank You", one of Stampin' Up! new photopolymer stamp sets. It is the first photopolymer stamp set I have owned and I LOOOOOVVVVVEEEEE it..sorry to shout, but really, really enjoyed using it! I added just a bit of color to the center of the flowers using Calypso Coral ink and a Blender Pen. Then just a touch of 2-Way Glue and some Dazzling Diamonds for a bit of sparkle. I stamped a little heart from the Another Thank You stamp set, fussy cut it out, popped it up with a Dimensional and added a bit of sparkle to it as well for the jewelry. I hope you have enjoyed today's project and are inspired to get crafty!